Commander Tanto Knife features a sharpened 6 ¼ inch tanto size blade. The stainless steel blade has a non-reflective anodized black coating and a blood groove. The tip of the blade features a tanto point. The knife measures 10 11/16th inches in all and has an injection molded handle which gives the knife a secure non-slip grip. These knives also feature a lanyard hole and a shoulder harness. Buy the Commander Tanto Knife for only $24.99. 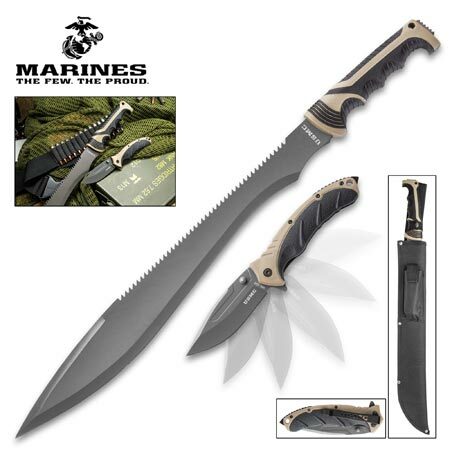 USMC Blood Brothers Knife Set features two versatile knives; a Barong sawback machete and an assisted opening folder. Each knife has a sharpened stainless steel blade with a rugged, non-reflective black coating. They have carefully formed, tough molded handles with a non-slip ergonomic grip and a functional glass breaker pommel. The formidable 23 ¼ barong has a 17 ¼ inch machete blade and potent serrations along the spine. This craggy sawback is designed to rip through tough materials like wood and rope fiber. The folder features quick, single-hand blade deployment via a smooth assisted opening mechanism. It has ambidextrous thumb studs, flipper, liner lock and pocket clip. The folder has a 3 ¾ inch drop point blade and is 5 inches closed. The Blood Brother Knife Set is officially licensed by the USMC. 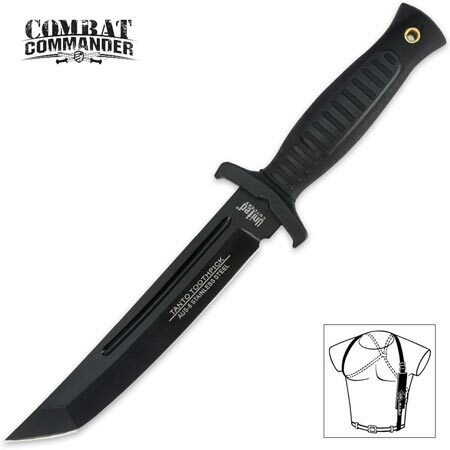 Both knives are contained in a single heavy duty nylon belt sheath. Buy the USMC Blood Brothers Two Piece Knife Set for only $39.99. The popular Bushmaster Survival Knife feature a highly sharpened 420 J2 stainless steel blade. The Bushmaster measures 15 inches in all with a sharpened 10 inch blade. The black cast metal handle contains a survival kit which includes band-aids, sewing needles, matches, a surgical blade, a magnifying glass, fish hooks with line and sinker. 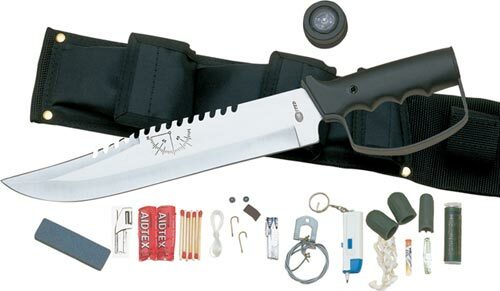 The heavy duty nylon scabbard has a can opener, sharpening stone, animal snare, snakebite kit and a flashlight. Buy these Bushmaster Survival Knives for only $49.99. Note: This item cannot ship to NY, MA, CA, DE. Honshu Full Tang Tanto Knives feature a highly sharpened, full tang blade. The blade is manufactured of 440 stainless steel. The blade features a thick, sharp and full tang construction. A robust blood groove extends over the entire 10 ¾ inch sharpened blade. These Honshu Tanto knives measure 16 ¾ inches in all and include a black leather scabbard. The rubberized grip provides a functional design to this knife. These knives also have an oversized hand guard that is made of stainless steel. 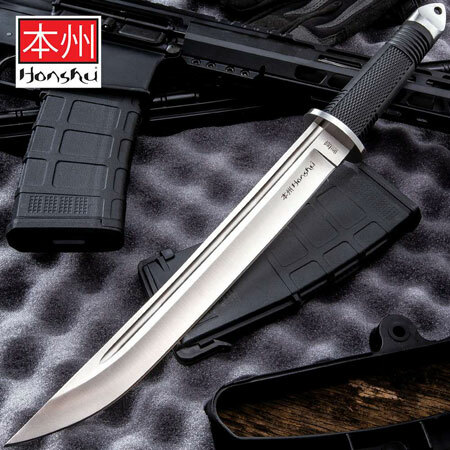 Buy the Honshu Full Tang Tanto Knives for only $59.99.